The richness of its' bio-diversity is well reflected by its' sheet concentration of fauna currently around 439 species have been recorded with 236 being resident and 203 being migrants or visitors and 33 species are endemic to Sri Lanka along with 68 sub species. Among the resident forms the latest addition to the endemic list of Sri Lanka is seen and scopes owl. Northern winter around August to April every year around 120 migrant species arrive in Sri Lanka. 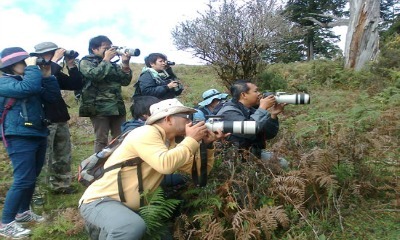 More successful for birding is the Bird sanctuary or the national park reservoirs, tanks, lakes, river banks, lagoons and the rain forest. Forest birds and the wet land birds are found thought the dry and wet land zone. The top three locations are Horton plains, Knuckles and Adams' peak can be seen endemic high land birds. So low land dry zone forests are Yala National park, Bundala National Park, Udawalawa National Park are ideal for a mixture of bird habitats comprising wet land, lakes, dry scrubs and grass land. Sri Lanka is one of the smallest but biologically diverse countries in Asia. Indeed the country is listed by conservation internationally as one of the worlds' 34 official Bio- diversity hot spots. In addition the Sinharaja forest reserves the countries' vast visible area of primary tropical rain forest which is the seventh of UNESCO world heritage site. Sri Lankas' high proportion of endemic species is remarkable including land crabs all 51 species are endemic. This is famous as a bird watching site. Layerds' parakeep, Golden fronted leaf birds, Blue winged spotted dove and Merald dove.This is situated just adjoining the world famous Sri Dalada Maligawa, Kandy,Sri Lanka Udawatta Kele Santuary is a historic forest in the city of Kandy as said earlier during the days of the Kandyan kings Udawatta kele was known as "Udawasalawatta"(a place above the royal palace). The sanctuary is famous for its' extensive fauna, a variety of floral species present in the sanctuary. The forest is also religiously important as it is widely used as a meditation hermitage. From the ancient times Udawatta kele was designed as a forest reserve since 1856 and it became a sanctuary in 1938.